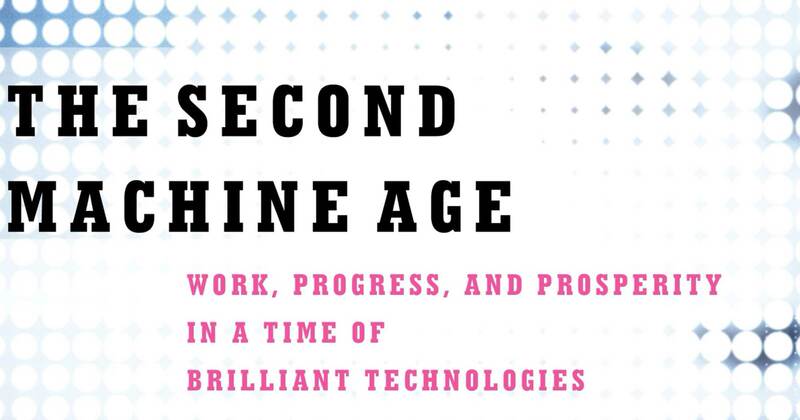 I recently finished reading The Second Machine Age: Work, Progress, and Prosperity in a Time of Brilliant Technologies by Erik Brynjolfsson and Andrew McAfee and it left me with quite a bit to think about. The premise of the book is that while the first machine age used the “forces of energy trapped in chemical bonds” to release us from the limits of muscle power, the technologies we have as part of the second machine age are doing the same for mental power. The first machine age was all about mechanization: discovering how to use (primarily) chemical reactions to produce mechanical power, freeing us from the limits imposed by muscle power (both human and animal). This greatly expanded our boundaries of time and space, allowing us to travel much further and faster that was previously possible, as well as increasing our production capability. The second machine age is about knowledge and information: using electronic methods to extend our communication and mental capabilities. Computers with their essentially-infinite storage capacity and near-instantaneous communication speeds allow us to “remember” anything at any time without actually storing it in our brains, and we can easily communicate with other people at different geographic or temporal locations. While modern technology absolutely brings benefits, we should beware of its dangers as well. The authors noted “The Industrial Revolution was accompanied by soot-filled London skies and horrific exploitation of child labor. What will be their modern equivalent? Rapid and accelerating digitization is likely to bring economic rather than environmental disruption. … Technological progress is going to leave behind some people, perhaps even a lot of people, as it races ahead. … Over time, the people of England and other countries concluded that some aspects of the Industrial Revolution were unacceptable and took steps to end them (democratic government and technological progress both helped with this).” (pages 10–11). Moore’s Law and similar software improvement capabilities illustrate how the speed of change is accelerating. Digital information is “non-rival” (not “used up” when accessed) and has a near-zero cost of reproduction (it’s extremely cheap to make another copy). General-purpose technologies (like a typical computer, general command-line utilities, etc.) have become pervasive and enable a huge number of new inventions when combined in new and interesting ways. The authors note that in the first machine age, the wealthiest individuals were those who owned and controlled tangible assets—such as factories and means of production—while the less-skilled workers (those who actually did the work) did not fare as well. They draw the conclusion that as in the first machine age, those who control the capital will become increasingly more wealthy and powerful. The authors discuss the trend of first-to-market and/or top-quality sellers capturing a huge share of the market (a much larger market share than is typical in physical product markets), mostly due to the non-rival and marginal reproductive cost characteristics of digital products. A power law distribution graph (long tail) illustrates this, compared to a normal distribution (bell curve) that previously was typical in markets—both goods markets and labor markets. There is no large bump in the middle of a power distribution graph; power and wealth is highly concentrated at one end. There is no “average” or “typical” in a power distribution graph. The authors conclude by examining how humans and computers are likely to interact with each other in the future (spoiler alert: computers and humans are most effective when computers complement or augment humans, rather than replacing them). They also offer a number of policy and long-term recommendations, but you’ll have to read the book for those. I would definitely recommend anyone in the technical industry especially to read this book, as well as anyone in the position to influence public and education policy.